At ICO Partners we do PR for a wide range of games (from SMITE to Armello) and recently we started working on our first episodic game: The indie title The Lion’s Song. To celebrate this week’s launch of Episode 2, we want to share some episodic-specific PR lessons we learned from supporting developer Mipumi Games in launching Episode 1 of the game. We decided to announce the whole “series” first with a general trailer, describing the game concept and teasing what the individual episodes would entail. 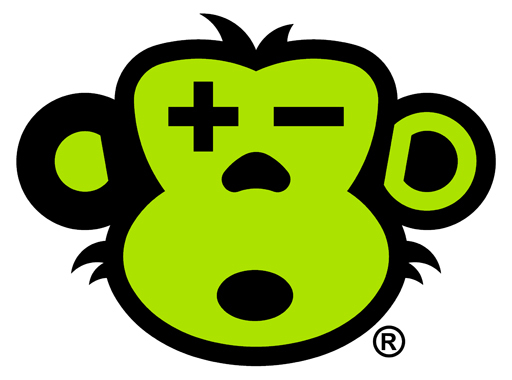 The challenge when promoting a game, and particularly when trying to make a strong first impression, is always to find as many strong talking points and PR angles as you can. Focusing on just one episode for that first announcement would have severely limited the amount of talking points we had to work with, and wouldn’t have allowed us to sell the overarching vision for what the team are trying to achieve with the season as a whole. This additional outlook on the other episodes could also give further incentive for players to buy a Season Pass. A downside of announcing the season first is that it means you need to nail down details and commit early. Additionally, having a trailer showing footage of all episodes at such an early stage proved to be a challenge because…well, the studio only had footage of Episode 1 at this point. To make this work Mipumi Games had to create individual sections for the later episodes from scratch just for the video, which of course could have a knock-on effect on the development plan and schedule. Looking at the coverage breakdown though (graph above), we would highly recommend this approach for promoting smaller episodic games. 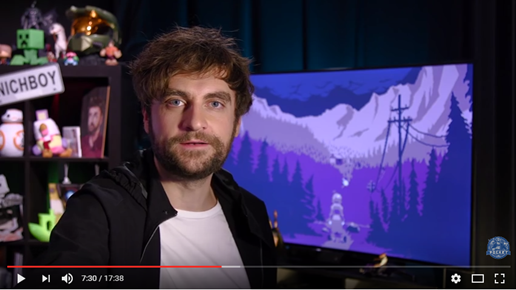 For us having a general reveal trailer of The Lion’s Song resulted in 74 online articles and got even more articles than the launch of Episode 1, with announcement coverage from high profile sites such as Killscreen, Pocketgamer, France’s (and looking at Alexa also Europe’s) biggest gaming site Jeuxvideo.com and the major German gaming site PCGames.de. Mipumi Games decided to launch Episode 1 – Silence for free: they saw this as an opportunity to expose the game to the largest number of players possible from the beginning, and that would hopefully convince players to stick around for the upcoming episodes. From a PR point of view however, we were concerned that having a free first episode could result in media thinking The Lion’s Song was a small, almost fan made-like game, which could result in them deciding against covering it. After all, it’s a pixel art title from a relatively unknown studio, and all of our messages and promotional assets would say it’s free. To avoid this from happening we put a lot of work into finding the best phrasing in the communication around the free episode correctly. Whenever we said Episode 1 is free for instance, we would immediately mention that the whole Season Pass costs €9,99. By doing this, we let people know that this is a premium quality game, but a game that we wanted to bring people into and try for themselves by removing that initial barrier to entry. At ICO, we have developed a tool we call the Media Monitor that basically tracks thousands of websites and shows us how individual games perform in the press (for more info on how it works look here). 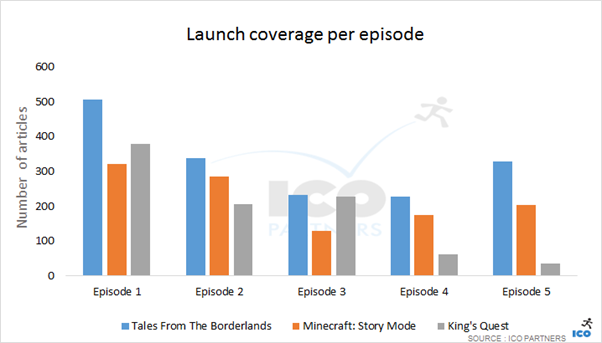 For The Lion’s Song, we took advantage of the tool and looked into data from other episodic games like Life is Strange, Hitman, King’s Quest or Tales from the Borderlands to see how their coverage evolved over time. 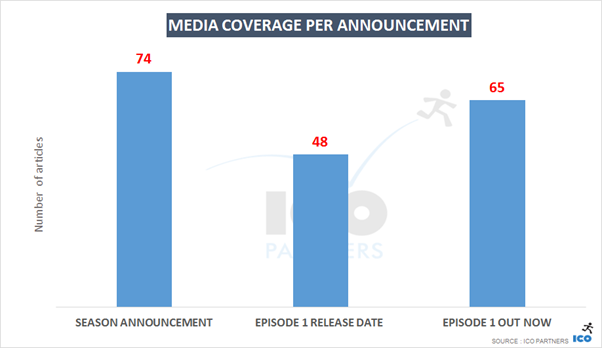 Looking at the coverage per episode it became clear episode 1 gets most media traction, whereas all episodes after that seem to drop in term of media coverage. You can see King’s Quest, Minecraft: Story Mode and Tales from the Borderlands as an example below. Based on the data we would recommend to put most of your PR efforts and resources, especially for assets, into the initial announcement instead of saving your PR fireworks for later to build up hype. Of course it makes sense to try to keep pushing to gather press attention, but the first episode will be the easiest points of your campaign to get eyes on your game, so take advantage of this. 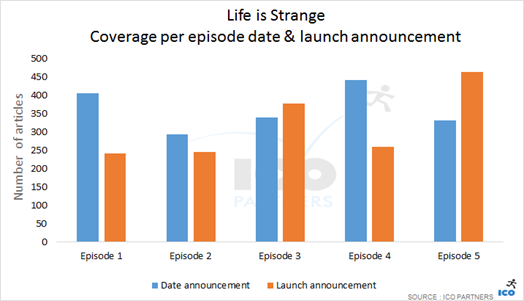 Life is Strange proved to be an interesting case study in another regard: we looked at how much coverage each episode got when it’s launch day was announced. As you can see, episode 4 clearly breaks the pattern mentioned above. What happened? They announced a newsworthy sales milestone of 1 million copies sold at the same time as announcing episode 4 to boost their announcement – a clever way of helping the “weaker episodes” gather more traction. That’s something we are looking into for the upcoming episodes of the Lion’s Song. If you have followed the discussion around That, Dragon Cancer, the developers were not too happy about people streaming and putting together walkthroughs of their narrative game as they felt it hurt sales. Even though The Lion’s Song is a narrative game as well, the whole dynamic changes with episodic games, especially when episode 1 is free. 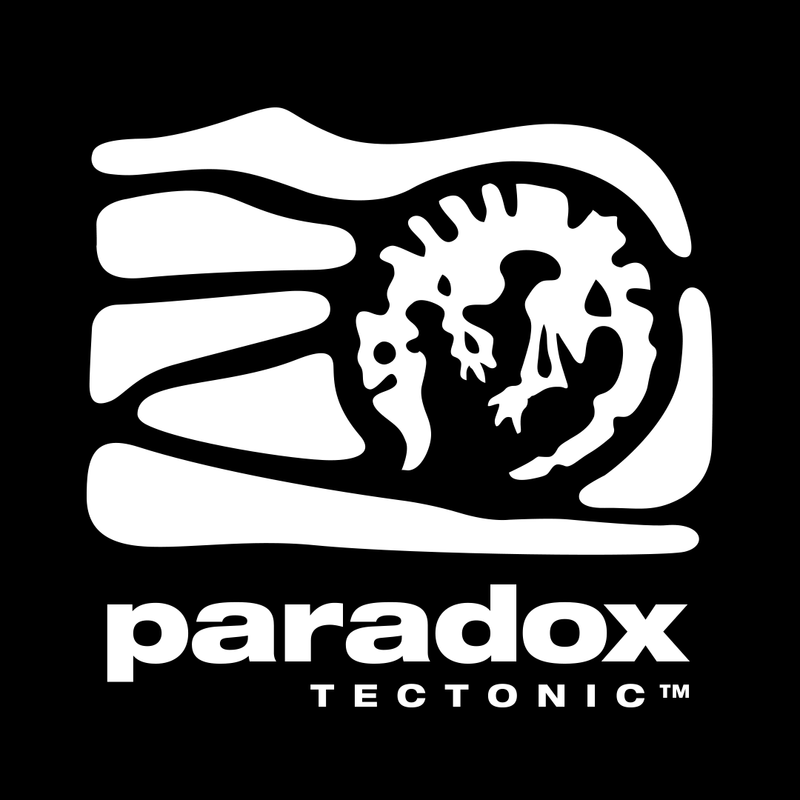 Working on many titles in a more traditional release cycle, we are used to announcing release dates before launching a game to get players and press in the right mindset, letting them know the game is coming soon and hopefully getting them excited. Looking at other episodic games, their tactics vary widely: From announcing the release date a week before (Life is Strange) to simply announcing the moment the episode becomes available, like most mobile games. Going through our Media Monitor, we couldn’t make out a clear pattern that generally seems to work best, but we still learned a valuable lesson: a release date announcement for smaller games generally splits your media impact between two news beats (release date and launch shortly after) and can therefore drastically weaken your media impact on launch day – a moment where you usually want most players to hear about your game because they can get their hands on it straight away. 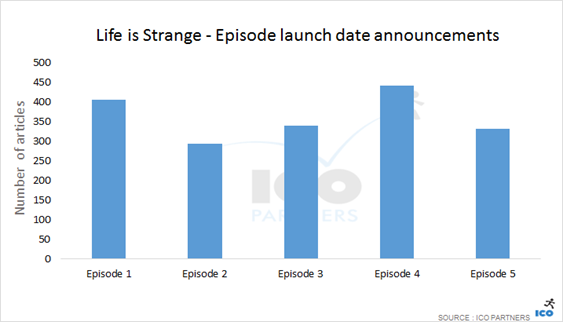 For high profile titles like Life is Strange (graph below) this might not matter too much, as media and a large, enthusiastic player base are generally aware of and excited for an episode’s upcoming launch anyway. For a smaller game gaining traction for two news beats close to each other seems more difficult. 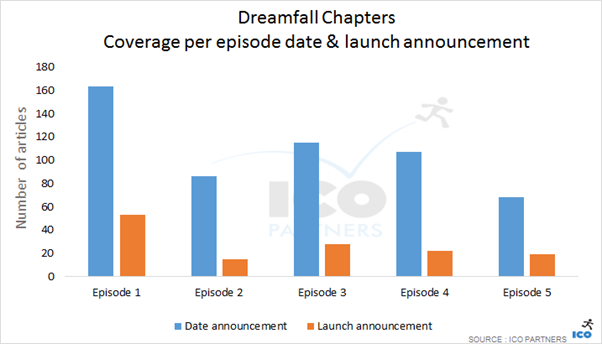 As an example we looked at Dreamfall Chapters (which is a bigger project but didn’t reach the scale of The Life is Strange’s media impact) and their media coverage with announcing the release date beforehand. For our smaller episodic game, splitting the news value per episode into two seemed like it would overall damage the media impact we can have, particularly for launching the traditionally weaker performing episodes. That’s why we decided that after Episode 1, we will only announce the Lion’s Song episodes once they are available to have the best chance of cutting through the media noise that day. That’s it for now. 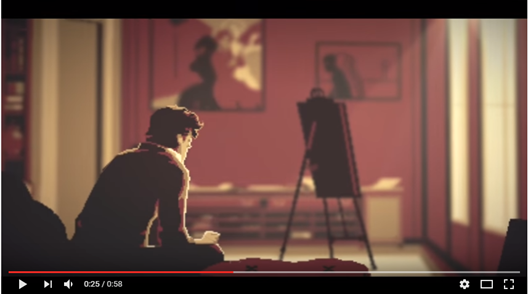 Thanks a lot to developer Mipumi Games for letting us share these insights and data points. We hope you found it helpful. If you have questions, or other tips you can reach me under @Olima on Twitter and in the comments.